So writes the Economics Fanatic (www.economicsfanatic.com) in edited excerpts from his post* on seeking Alpha entitled Dr. Marc Faber’s Market Outlook For 2013. This article is presented by www.FinancialArticleSummariesToday.com (A site for sore eyes and inquisitive minds) and www.munKNEE.com (Your Key to Making Money!) and may have been edited ([ ]), abridged (…) and/or reformatted (some sub-titles and bold/italics emphases) for the sake of clarity and brevity to ensure a fast and easy read. The author’s views and conclusions are unaltered and no personal comments have been included to maintain the integrity of the original article. Please note that this paragraph must be included in any article re-posting to avoid copyright infringement. That something is not quite right with the economy is evident from the recent performance of Wal-Mart, Tiffany, Genesco, and Kohl’s. What disturbs me about most asset markets is that we had outsized gains since early 2009 (there are exceptions such as Vietnamese, Chinese, Japanese, and European equities, and also US housing). In my opinion, investors’ expectations about future returns on their assets are far too optimistic. In a world that currently hardly grows investors will need to reduce their future return expectations. I believe 2013 will not be a favourable year for holders of assets. My priority has now shifted to the preservation of the outsized gains I have achieved over the last three years. Very clearly, Dr. Faber is hinting at volatile or declining markets in 2013. It is difficult to discuss the outlook for the whole year in an environment where markets are constantly bombarded with news related to economic activity and policy action. However, one can discuss the likely trend based on the existing factors, which would impact risky asset classes in the foreseeable future. In line with Dr. Faber’s view, I am neutral to bearish when it comes to predicting the market outlook for 2013. Before I discuss the reasons, I must emphasize here that I am not predicting any major market crash. However, it would not be surprising to see sideways markets in 2013 with a relatively high degree of volatility. I am of the opinion that corporate earnings will disappoint in the fourth quarter of 2012 and [that] this trend will continue into 2013. The U.S. economic activity remains very sluggish. This point is underscored by the fact that U.S. holiday retail sales have registered weakest sales growth since 2008. In an economy driven by consumption, this is an ominous sign. The eurozone is already in a recession with economic activity expected to remain gloomy in 2013. The growth drivers of the global economy (China and India) have also cooled down with muted economic growth for both these economies. With this scenario existing globally, it would not be surprising to see corporate earnings decline in Q4 2012. 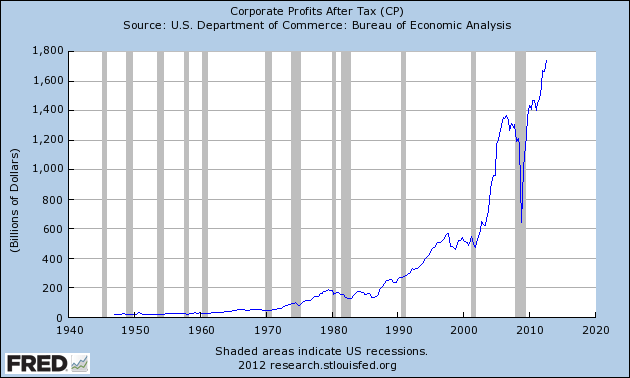 U.S. corporate profit after tax reached record high levels in Q3 2012 [see graph below]. I do expect this trend to reverse in the fourth quarter. Also, the downward earnings trend should continue over the next few quarters as there seems to be no positive upside trigger in sight for relatively robust economic activity. the S&P is trading at near multiyear highs amid global gloom. Very clearly, the liquidity factor is driving equity markets higher. I am certainly not suggesting that liquidity is the only factor. However, the markets might discount more pessimism than optimism in 2013. The S&P 500 index is currently trading at a P/E of 16.4, which is not very far from the market P/E during peak global economic activity in 2006 and early 2007. This makes me slightly cautious considering the current global economic scenario. [While] 0ne might argue that liquidity can continue to prop up markets, it is important to understand that market participants might move to relatively safer asset classes if excess liquidity does nothing substantial to the real economy. 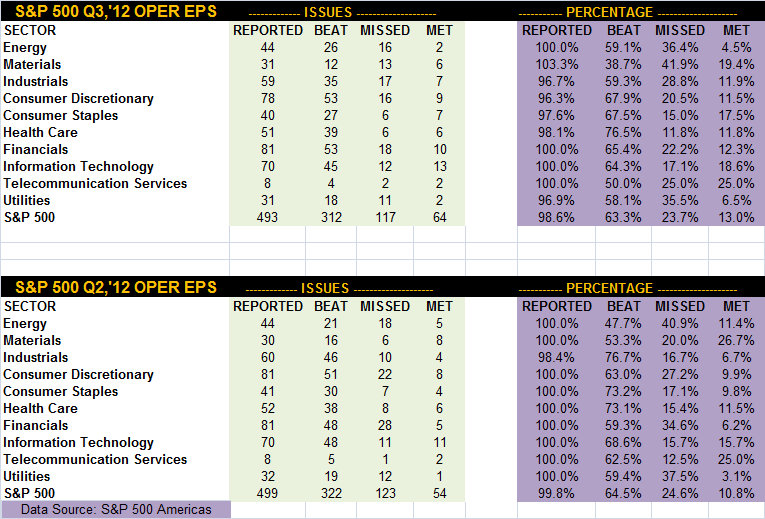 Continuing the discussion on index earnings, the table below shows that 63.3% of S&P 500 companies beat analyst estimates in the third quarter of 2012 compared to 64.5% in the second quarter of 2012. I can say with some conviction that more companies will miss on analyst estimates in the coming quarters leading to correction in specific stocks and the broader markets. As mentioned in Dr. Faber’s summary, some stocks have already started correcting discounting relatively poor results in the foreseeable future. …A clear policy outlook [would make] it easier for the private sector to plan their growth strategy but, with the fiscal cliff issue still being debated, the private sector is going slow on expansion and employment plans and, with the private sector being the economic growth driver, this will lead to relatively slower growth. Also, the debt ceiling issue and discussion is not far away and has the potential to make market participants nervous and rush towards safer assets. It must be noted here that the last time the debt ceiling issue escalated, consumer confidence dipped to its lowest in a non-recessionary period. Therefore, the issue should not be ignored by market participants. As mentioned earlier, the continued failure of expansionary monetary policies to impact the real economy might trigger a negative reaction from equity markets sometime in 2013. Readers might argue that the U.S. is not in a recession and headline unemployment numbers are improving [and,] as such, government policies are working. However, I would look at indicators such as the velocity of money and the U6 rate to determine the real state of the economy. 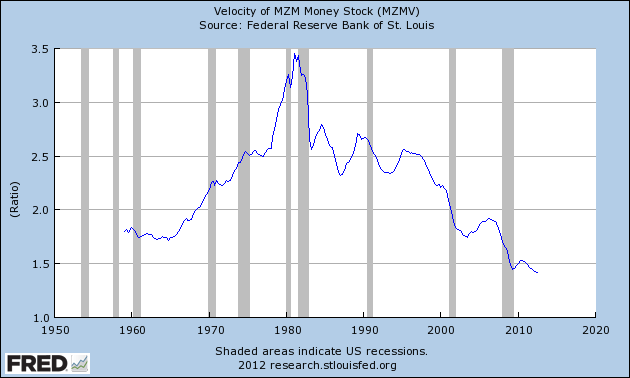 The money velocity continues to slump and is at its lowest levels in the last 50 years [see the first chart below]. 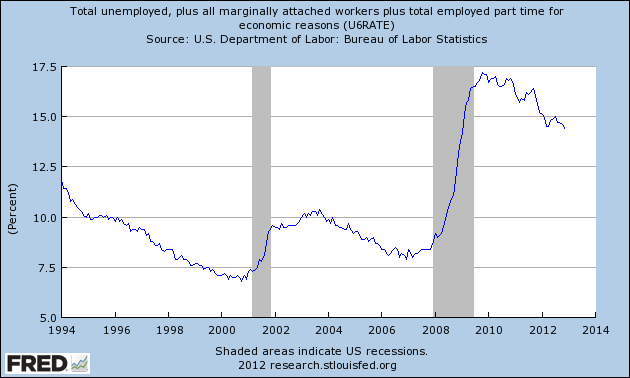 At the same time, the U6 unemployment rate remains uncomfortably high at 14.4% [see the second chart below]. These critical factors do make me believe that all is not well with the economy and the markets will react sooner or later to the real economic gloom. Dr. Faber’s view might be right for 2013 and investors do need to focus on capital preservation. Also, trading might not be a good idea as markets can exhibit a high degree of volatility amidst economic and policy uncertainty. SPDR Gold Shares ETF (GLD): I maintain [the] view…[that] investors…[should] consider exposure to the hard asset for the long term. In the near term, some more correction in the precious metal is entirely likely. However, expansionary monetary policies, artificially low interest rates and demand from Asian central banks will trigger long-term upside in the precious metal. The GLD ETF seeks to replicate the performance, net of expenses, of the price of gold bullion. iShares Silver Trust ETF (SLV): Very similar to the argument for gold, I am also bullish on silver for the long term. Investors can consider exposure to silver through the purchase of physical metal or the ETF, which seeks to reflect the price of silver owned by the trust, less the trust’s expenses and liabilities. Vanguard Consumer Staples ETF (VDC): Seeking a relatively defensive sector, I would consider exposure to VDC. The ETF seeks to track the performance of a benchmark index that measures the investment return of stocks in the consumer staples sector. The ETF has a low expense ratio of 0.19%. In terms of sub sector exposure within the consumer staples sector, the ETF has 19% exposure to the household segment, a 17.8% exposure to soft drinks segment, a 16.6% exposure to the packaged foods & meats segment, and a 16% exposure to the tobacco segment. Vanguard Health Care ETF (VHT): The healthcare sector is also a relatively low beta sector and less prone to economic shocks. The VHT ETF seeks to track the performance of a benchmark index that measures the investment return of stocks in the healthcare sector. The ETF also has an expense ratio of 0.19%. In terms of sub sector exposure within the healthcare sector, the ETF has 45% exposure to the pharmaceuticals segment, a 16% exposure to the biotechnology segment, a 14.9% exposure to the healthcare equipment segment, and a 7.3% exposure to managed healthcare. Johnson & Johnson (JNJ): This is a good investment option. I like this highly diversified healthcare company, with products as well as regional diversification. Further, the sector catered to by JNJ is not very prone to economic shocks. JNJ has been a good dividend payer in the past, with a dividend yield of 3.5%. In my opinion, the stock is excellent for the long-term portfolio as well. It also commands a higher rating than the U.S. sovereign rating. SPDR S&P 500 ETF (SPY): It has been proven that beating the index is not an easy task. Therefore, the strategy should be simple — beat the index or invest in the index. From this perspective, SPY looks interesting on any meaningful correction in 2013. The ETF provides investment results that, before expenses, generally correspond to the price and yield performance of the S&P 500 Index. 5. Don’t Ignore This Fact: “Greedometer Gauge” Signals S&P 500 Drop to the 500s by July-August, 2013! 10. Harry Dent Sees Dow 3,000; Seth Masters Sees Dow 20,000! Who’s Most Likely Right? BMO chief investment strategist Brian Belski went on Bloomberg TV yesterday and made a huge call: he told viewers that “we’re on the verge of the next great bull market” in stocks ( see video here) outlining his bullish thesis based on 16 economic and market indicators he factored into his call which can be seen here. Next What Do the Similarities & Differences Between the 1980 Top in Gold & the Current Situation Mean for Its Future?